Then last fall Daniel got together with his friend Casey to start the White House Organic Farm Project with the goal of going across the country and getting people to sign a petition urging the next president to grow vegetables in the white house lawns. 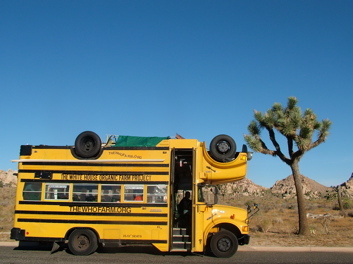 And they went driving in a topsy-turvy bus (see above) across 25 states and getting 10,000 signatures. And today the Obamas announced that they are growing to start a White House Vegetable Garden. Awesome. What an achievement for Daniel and Casey. Congrats Guys and Congrats to many others who have pushed the president to do this. The president growing vegetables locally could have a symbolic effect, raising awareness about eating locally grown and fresh foods. The power of an idea combined with belief and persistence can yield anything! Yes! Dhama and I were just reading about the Garden project this morning. How great it made us feel to see such a thing happening at the White House. I see it as yet another symbolic communication of the changes in our social fabric. It's got to start from the top down. How great is it? So great, it makes me feel so proud that Obama is leading by example.